We very much enjoyed our time with Nico. He was very knowledgeable and spoke very good English. A nice touch were the cakes and pastries his wife had made that he brought for our snack which made it special. Nothing was too much trouble and we enjoyed hearing about the local customs. Would highly recommend. TOUR GUIDE RESPONSE: Thank you very much for all your nice comments. I really apreciate it. For me it was a wonderfull experience as well! Hope to see you again some time. Best wishes! We spent the day with Nicolas. Nicolas is very knowledgeable of the area And is a great guy. He took us around Tierra de Fuego park With a lot of stops some hiking and a personal touch. We recommend him highly. TOUR GUIDE RESPONSE: Thank you Tal for being so nice. I really enjoyed as well our day together. You are wonderfull. Keep having fun. All the best to all! Nicolas was fantastic. The day we arrived it was drizzly and he was able to change the itinerary immediately to suit the weather. Gave us additional touring options to consider. Very knowledgeable about local fauna, geography, history, a good communicator. On a tea break, he introduced us to "mate" (an Argentinian herbal tea brew) and a super delicious coconut-dulce de leche tart. We (a party of six, including my 84 years old mother) couldn't ask for more. TOUR GUIDE RESPONSE: Hi Ben! I will let her know! Thank you very much for choosing my services. I´m happy to hear you enjoyed our day in Ushuaia together. For me it was a pleasure as well. I wish you all the best and if you have any question about the coconut/duche de leche tart just let me know! See you! Nicolas is an excellent tour guide and his tour provided our two couples with a memorable experience in Ushuaia. A genuine local, he is friendly, knowledgeable and helpful. Our visit to the Tierra del Fuego National Park included walks of the type we requested, and he produced tasty snacks and drinks from his backpack for morning tea by the River Pipo cascades on our first walk. Highly recommended! TOUR GUIDE RESPONSE: Thank you soo much Glenn for all the wonderfull words. I'm very happy to hear you had such a nice experience. I really enjoyed my time with you as well. Hope to see you again sometime. Best wishes! We had a wonderful time in Tierra del Fuego National Park with Nicolas. He was on time and had planned a great itinerary based on our email exchange. We loved his personality, his humor and the tremendous depth of his knowledge of all things about Ushuaia and the park. He took us to several quiet areas away from the crowds for short, peaceful and beautiful hikes - it was a perfect day! Thanks!! TOUR GUIDE RESPONSE: My pleasure Claire! I really enjoyed spending the day with you. Thank you everything! Nicolas was very attentive to our needs and super knowledgeable about the area. He knew just how to find things we were looking for. Our driver was excellent too! Nicolas was prompt, knowledgeable, friendly and accommodating. Did a great job for us. 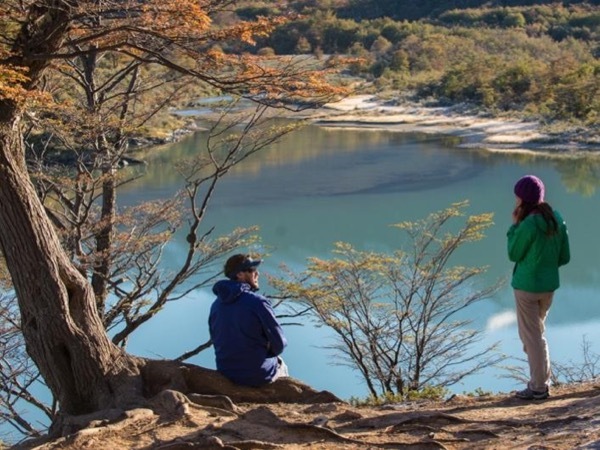 Nicolas' description of his tour said that we would explore Tierra del Fuego National Park at our own pace which is exactly what he delivered. He was extremely generous with his descriptions of the history, flora and fauna of the park, patient with our diverse interests and simply fun to be with. His surprise tea party (and mate demonstration) in a shady spot in the park was an inspired addition to our day and a visit to the End of the World post office was the perfect ending to a delightful tour. TOUR GUIDE RESPONSE: Thank you very much. It was a great pleasure. All the best!! Nicolas was an excellent guide! He was very welcoming and made it easy to find him when we arrived. He had a driver for us and was able to show us the town and all the main points of interest. We learned so much about the area and history of the Ushuaia. There is no way we would have seen the sites without him. He was so kind and patient that we felt comfortable and made it easy for us to immerse ourselves for the 4 hours he showed us around. We highly recommend Nicolas as a guide. He was awesome! TOUR GUIDE RESPONSE: Thank you very much Fabian for your nice feedback. For me it was as well very nice to meet you and your lovely family. I'm really happy you apreciate having a driver and my tour recommendations, thank you so much. Hope to see you again someday. All my best for all of you!